How to make your home more energy efficient: STO Property Maintenance Group’s top tips for an energy efficient home. STO has the most qualified electricians on the Gold Coast. Hire STO Property Maintenance Group for your maintenance needs. Your windows are a component of your home that can easily be modified to increase its energy efficiency. If you haven’t considered how much cool or warm air is lost through glass, maybe you should. Regardless of whether you’re sweltering through a hot summer, or in the middle of winter; installing curtains and blinds can work wonders on keeping the temperature at the desired level, without over working the heater or air conditioner. Another great option for keeping the temperature right in both winter and summer is the double-glazed window. Double glazed windows give you an added layer of protection and help contain cool air-conditioned air or warm heated air and can help increase the efficiency of your home. Installing insulation is another excellent method you can employ to keep your house cooler in the summer months and warmer in the winter months. You have the option of installing insulation in your roof, floor, walls or all three for an extra effective method. 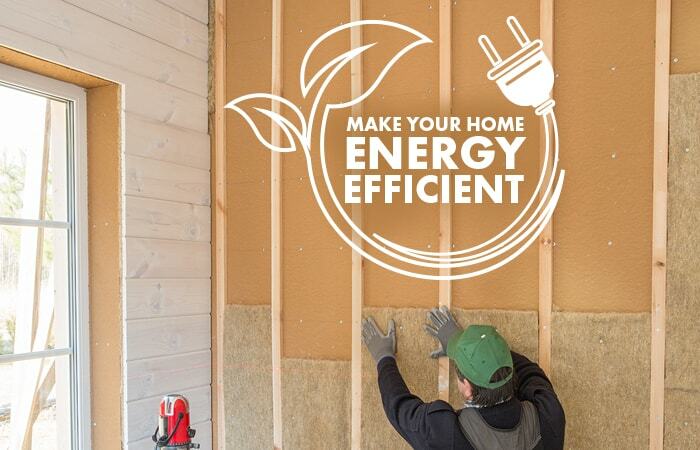 Insulation is a very energy efficient product that helps to seal your house and prevent unnecessary leakage; therefore, creating a more energy efficient home. Out of date, electric hot water systems can be a major influence on the price of you power bill and will drastically reduce the energy efficiency in your home.Research suggests that your hot water system uses more energy than all of your other electrical goods combined. Check out our recent article on finding the right hot water system for you. Install a more energy efficient solar model and see your power bills reduce immediately. You should consider the lighting that you have installed in your fixtures. For example,LED lights are much more efficient than fluorescent lights. There are a range of products available that can help reduce the amount of electricity used while still providing excellent lighting. This is a sure-fire way to increase the energy inefficiency in your home or office. There are some great energy monitors out there that can help you to monitor your household’s power usage. Energy monitors offer a real-time display of your energy usage and can track the power usage of the whole house, or individual appliances. These energy efficient devices can help you stay on track to run an energy efficient household or business. If you’re building afresh or renovating, try building with the climate in mind. Think about the positioning of your house on your block and the direction that it faces. For example, don’t build facing directly west, where the sun will be hottest in summer. Take advantage of features such as oversized eaves or verandas; as they will passively keep your house cooler. Also, the construction of a home with higher ceilings will help hot air dissipate without the need for electrical appliances. Strategically planting trees and shrubbery around the outside of your house will help protect you from the heat of the sun, and add a layer of protection from cold winters.Natural vegetation is the easiest way to insulate your house from the outside. Don’t forget that the colour tone of your house may have an effect on your ability to efficiently cool or heat it. For example, don’t opt for a dark coloured roof, instead select lighter colours in order to reflect the sun in the summer months.This will help you to reduce the need for air-conditioning and increase the efficiency of your home. For example, simply installing a traditional fireplace instead of an electric heater can increase the energy efficiency of your home tenfold; yet heat your house capably. We also recommend installing ceiling fans in place of air conditioning units, as they use much less power, and when combined with our other tips are just as effective at cooling your home. We at STOProperty Maintenance Group, offer expert consultations and tips on how to make your home more energy efficient. STO Property Maintenance Group also offer professional maintenance services and can assist with any jobs around the home or office, such as installation of: energy efficient light bulbs, energy monitors, windows, insulation products, roofing, new hot water systems and fireplaces.We service the Gold Coast, Brisbane and Sunshine Coast regions. Contact us today!